For centuries, explorers and adventurers have ventured into the Amazon jungle in search of a lost civilisation known as El Dorado or the City of Z. Long dismissed as a myth, it now turns out that there was indeed a human settlement in the upper Amazon basin. The Guardian reports that new satellite imagery and fly-overs have revealed more than 200 huge geometric earthworks near Brazil's border with Bolivia. Some date to as early as 200 AD, others to 1283. 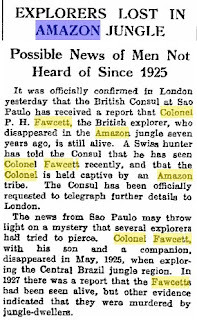 Fawcett's earlier Amazonian reports were to provide an inspiration for Arthur Conan Doyle’s The Lost World. Naturally, he features in Those Who Dared, but for a brilliant study of the man I would recommend David Grann's The Lost City of Z. 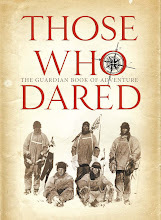 A film of the book, starring Brad Pitt as the explorer, should be realeased, later on this year. I have read Exploration Fawcett, written by Percy Fawcett and edited by his son Brian, it is an essential read to anyone interested in the Fawcett story of stories of exploration and adventure. Amazon Adventure (Fiction) is a new book about the lost Fawcett expedition, which continues the Colonel's journey to the Lost City of Z.